Jan Struther was the pen name of Joyce Anstruther, later Joyce Maxtone Graham, an English writer. Starting at about age 16, she wrote articles, poems, and short stories for periodicals such as Punch. She's best remembered today for her character Mrs. Miniver, originally created in 1937 for a series of newspaper columns for The Times of London. She also wrote the words for several religious hymns still in use today including "Lord of All Hopefulness." 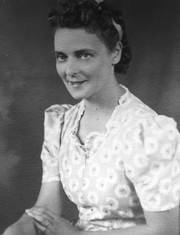 Her granddaughter Ysenda Maxtone Graham published a biography of her in 2001. She is the great-aunt of Ian Maxtone Graham, former co-executive producer of The Simpsons. Jan Struther is currently considered a "single author." If one or more works are by a distinct, homonymous authors, go ahead and split the author. Jan Struther is composed of 3 names. You can examine and separate out names.